I joined GRP&D in late 2006 after serving the previous 18 years with the Strath James Pipe Band as Drum Sergeant. 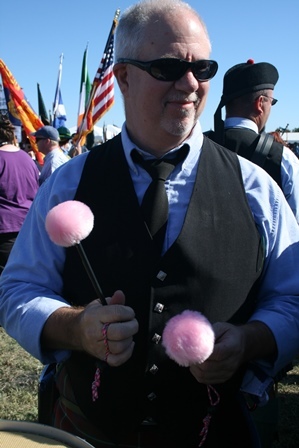 I have been a part of the pipe band scene since the early 70's (with a 9 year hiatus in the 80's). I have studied pipe band drumming with the late John Murray, Andy White, Tom Foote, Mark Humphrey and John Quigg. I also studied general pecussion under Donald Bick and John Floyd. Since 2011 I have been playing bass drum with the grade 3 circle as well as snare drum with grade 5. I also compete in bass and tenor drum solos.